CLEARSOL Solution is a sterile Balanced Salt Solution, each ml containing Sodium Chloride (Nacl) 0.64% potassium chloride (Kcl) 0.075%, calcium chloride (0.048%) , magnesium chloride hexahydrate(0.03%), sodium acetate (0.39%) ,sodium citrate (0.17%), sodium hydroxide and or hydrochloric acid (to adjust pH), and water for injections. CLEARSOL solution is an isotonic solution for use in irrigating tissues of the eyes. This solution contains no preservative. Primary packing - Non PVC Infusion Soft Bag with spike Port & Injection port. Secondary Packing - P.P. pouch, Shipper box. 100ml in Non PVC Infusion Soft Bag with spike Port packed in sealed pouch. 250ml in Non PVC Infusion Soft Bag with spike Port packed in sealed pouch. 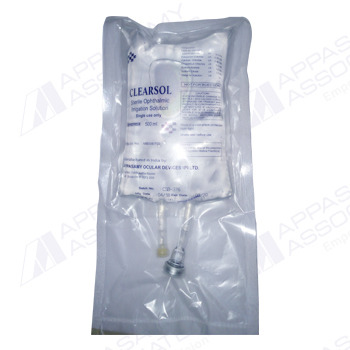 500ml in Non PVC Infusion Soft Bag with spike Port packed in sealed pouch. Store in a cool place protected from light. Used as irrigation fluid during various ophthalmic surgical procedures. Cataract surgery and intraocular lens (IOL) implantation: Use an administration set with an air inlet in the plastic spike since the bottle does not contain a separate airway tube. Follow directions of the particular administration set to be used. Grasp plastic ring on top of bottle and pull down along scored area. Then pull radially around the cap and remove. Remove the spike port protective cover by lifting up on the finger grip tape. Insert spike aseptically in to the bottle through the center target area of the recessed membrane. Allow the fluid to flow and remove air from the tubing before irrigation begins. One transparent non PVC infusion bag having an injection and spike ports free from any visible particles packed in corrugated shipper box.